Baby Buddies by Whistler Studios is an adorable collection filled with a soft pastel color palette and sweet gentle prints. From teddy bears to little duckies to baby socks drying on the line, this fabric is just too cute for words. Baby Buddies is the perfect kit to put together a little gift for your most cherished little friend. 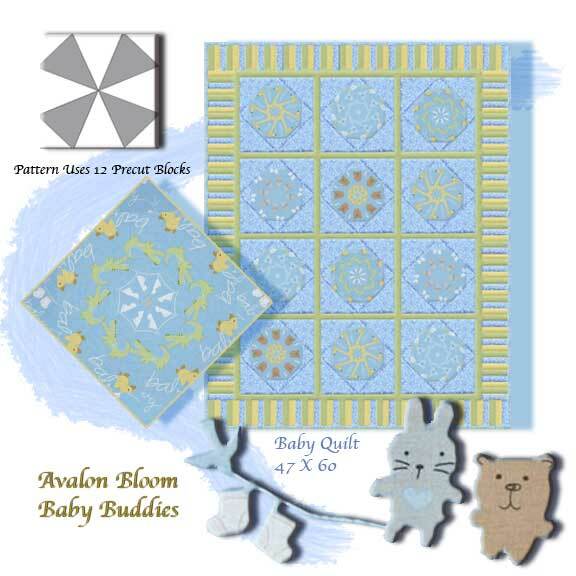 Kaleidoscopes cut from Baby Buddies by Whistler Studios for Whindham Fabrics Pattern 35120-2 .Make the perfect heirloom baby quilt that finishes 47 X 60 inches. Twelve precut kaleidoscope blocks are included along with the fabric and binding fabric and instructions to cut and complete this crib sized quilt top. Batting and backing are NOT included.